I was pretty happy to be in Bukhara, although I hadn’t been camping in the desert I still hadn’t slept anywhere with a shower for three days. Getting cleaned up felt great even more so as I made myself wait until I had cleaned off some serious mud from my bike. Bukhara was a good place to spend a day’s rest, it is apparently Central Asia’s holiest city and had some very beautiful examples of the 3Ms (mosques, medressas and mausoleums). 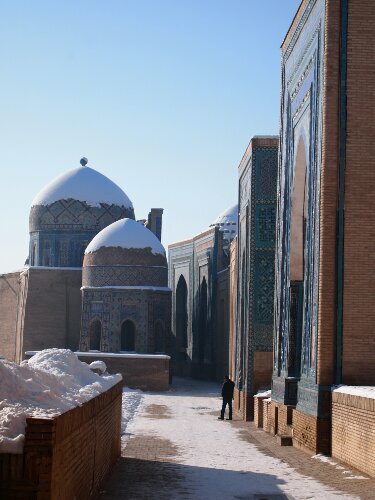 Bukhara was also one of the major cities on the silk route which I have been following for weeks. It was also in some ways a good time of year to visit in that there were not many tourists about giving me the run of the city. On the other hand on the final day it was snowy and icy and footing was treacherous. 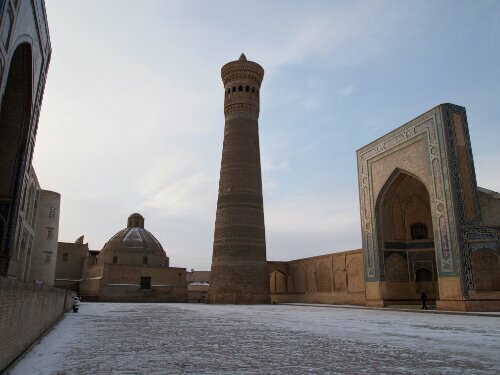 According to legend Genghis Khan spared the minaret in the picture above as he was so amazed by it. At 47m tall it was possible to see why. Another important sight there was the Ark, which is Bukhara’s oldest structure and looked to be some kind of fortress. Sadly it hadn’t been restored very much or well and was rubbish inside. After a couple of nights in Bukhara it was time to head off again for perhaps the most famous city on the silk road: Samarkand. I was hoping for an easy three days riding as it was only 265km to my next destination and I was planning on arriving in time for New Year’s Eve. I managed to make it in time but it was hardly the three easy days I had been expecting. The first day was perhaps the least troublesome with some headwinds in the morning. It was not until the evening when I tried to find accommodation that things got a little bit weird for a time. My first bid for somewhere to sleep was made near the new Uzbekistan Airways/Korean Air Cargo airport – which I assume had been built as a bridgehead for flooding Uzbekistan with cheap Samsung goods. Just past this there was a cheapish looking hotel where I enquired how much a night would be. When they said $20 I was shocked that seemed far too much, about $10 more than I had been paying. It was only after about 5km that I realised that it was still only GBP 12 and that I probably should have just paid it rather than riding off into the falling darkness again. I wasn’t going to turn back though. 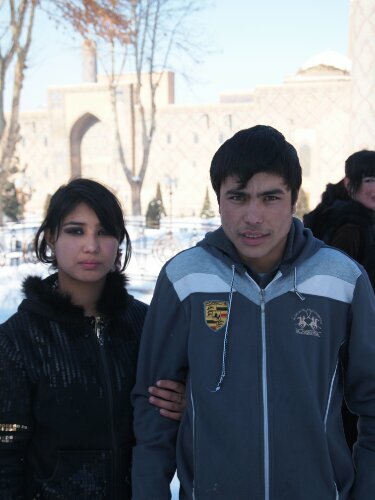 Carrying on I reached what I assumed was the edge of the city of Navoi which I knew I would be coming up on. Here I started asking if there was anywhere to sleep – I got pointed further down the road by one man. Then as I was speaking to the next group about 5km down the road a man came up to see what was going on. No one spoke any English. When the guy who came up realised I was looking for somewhere to stay he was pretty insistent I go and stay with him. My instincts were telling me there was something wrong here – while he didn’t look dangerous I got the impression he might be a bit half cut. I tried to pick up on what the guys I had been speaking to to start with thought but they weren’t giving anything away. So in the end, against my better judgement, I decided to follow him. 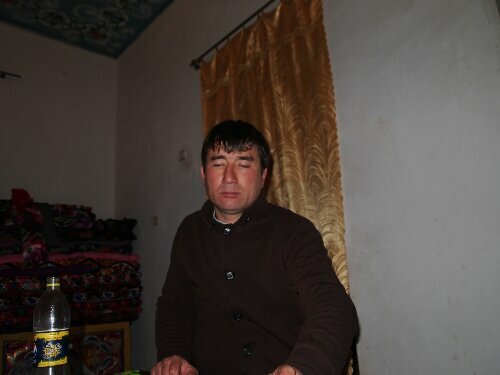 I was in a small town in Uzbekistan and there were quite a few people around so I figured I would be OK.
Aktam as his name transpired to be led me to his house and showed me where I could put my bike: somewhere safe outside and then let me take some stuff inside. Here I was happy to see some members of his family: his mother and a child who it would turn out was his daughter. I felt on safer footing now, as here was a family setting similar to those I had experienced before. I was about to make myself comfortable. Next thing Aktam is insisting I come with him, he is mentioning names of food and I assume he is going to take me somewhere I can eat dinner. I quickly put my stuff down and go to follow him realising that he probably is a little drunk. Off we go into the night and cross the road and head into an Uzbekistani off licence. Well, if he wasn’t drunk now he was going to be after the litre of vodka he purchased! He kept trying to get me to get some as well, I wasn’t having any of it though – I don’t like to drink when I am not on a rest day and I really don’t like to drink with already tipsy strangers in rural Uzbekistan. Vodka in hand he led me back across the highway to an empty restaurant and into a backroom where four of his friends were already eating and drinking. This was not what I had had in mind when I had started looking for somewhere to sleep that night. I was quite nervous to be in this situation as you hear lots of stories about people being violent in Central Asia after a few drinks – a bit like Glasgow and I didn’t really know how to act. One thing was sure I didn’t want to start drinking myself and politely rebuffed all their offers of vodka. Aktam must have drunk my share as he was worryingly shovelling it down – I could see it being a very long or very short night. Thankfully it tended towards the latter and once the vodka and food was done, about two hours later, we headed out. Some of us steadier than others. They had tended more towards random acts of hugging than violence thankfully. There seemed to be some confusion about payment as the waiter followed us for a while and seemed to want more money but that was just how I interpreted it. I was guessing for a lot of the evening what was going on and what was expected of me. Alcohol does not make people easier to communicate with. Happily I got back to Aktam’s with Aktam (it was only about 50m) and nothing bad had happened to me – I wondered what I had been worrying about. 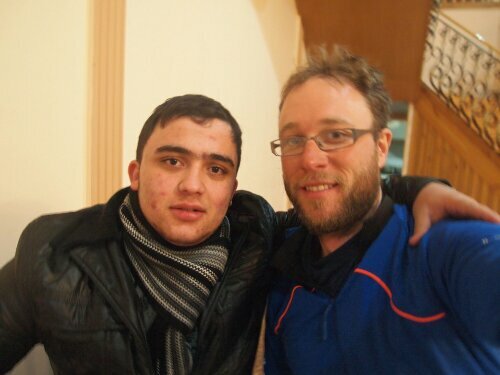 At Aktam’s I felt much more comfortable as his wife and mother sat me down and gave me tea and fed me and him again. They both kept looking at him with a mixture of long suffering and embarrassment as he acted progressively more inebriated. By the end of the evening he was just sort of rolling around making mewling sounds. 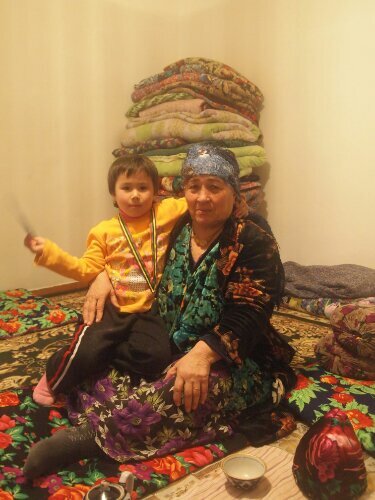 It was nice to be able to spend some time with the whole of an Uzbekistani family rather than just the men. Aktam’s wife and daughter were very interested in the photos on my camera and had lots of questions about my trip. The daughter who was six also gave an impressive impromptu gymnastics display – with cartwheels, the splits and various other uncomfortable contortions. She also let me wear her medal. 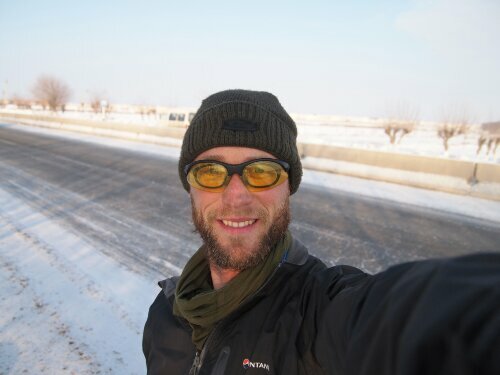 The next day after a surprisingly good night’s sleep I set off for Samarkand again determined to make good time so I would have as little distance to ride as possible on NYE the next day. This started out fine but then went epically wrong as the whole highway froze over. The smile would be wiped off my face in short order as my bike went sliding out from under me four times in the next couple of hours of riding. Luckily I only bruised myself properly once as I quickly learnt that going slowly was the best idea in this situation. Falling off at 10 kph didn’t hurt very much. That said impact wasn’t the only thing I had to worry about, there were still other vehicles using the highway and Uzbekistani drivers have funny ideas about lane discipline, so I just had to hope to myself that no one would be coming up behind me if I was to lose it again. Thankfully no one did and as the day went on more and more of the road came free of ice – I did spend about 20km riding on the wrong side of the highway as the sun had melted more of the ice on the other side of the road. 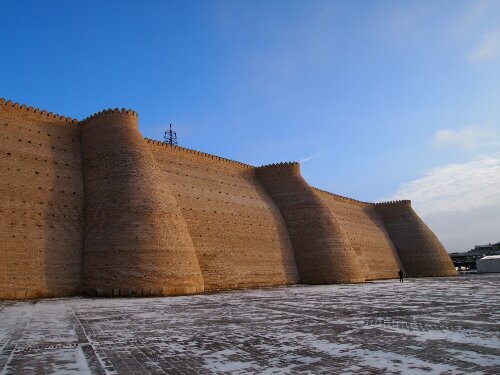 Finally I reached Kattakurgan, a large town before Samarkand and where I hoped to sleep. Finding a guesthouse I could use turned out to be harder than expected and involved me following a helpful man in his car for five kilometres to a guesthouse. It turned out I couldn’t stay here though and a different man led me to another. This was quite nice as I had my own room and there was even an indoor toilet. The people were very nice as well and one of the guests showed me where a restaurant was and ate dinner with me – insisting I take a photo of the two of us. He was also keen to see some English money as he hadn’t seen any before. I showed him a twenty and a fiver – he asked if he could have them. I made it clear as politely as possible that the value of these notes was equal to about 111,000 Uzbek som which is a wedge of notes about 2 inches thick and enough money for four nights accommodation. Making their value clear took some doing as he wanted to buy them from me and at first thought they were worth 11,000 som. I didn’t think he would actually want them when he realised how much they converted into…but no once I had got it across he reached into his jacket and pulled out a massive chunk of cash and extracted 100,000 ready counted som from it and then another 11,000 and so bought GBP 25 off me. After another good night’s rest I woke on New Year’s Eve with what I hoped was a nice easy 80km to do to Samarkand, meaning I should arrive in the city well before dark, possibly just after lunch if I was quick. It didn’t turn out quite that way. I was struggling to make time and couldn’t work out why, I kept getting slower and struggling more – I though it might be the wind but it wasn’t that windy. I thought I might be low on energy because I hadn’t eaten breakfast properly, but it wasn’t that because I was still going slowly after stuffing myself with snickers and other snacks. Then I thought it might be the gradient as I knew that there was a slight slope to Samarkand but it really didn’t seem steep. I was going nuts and really really struggling along. So I stopped for a rest to eat something and check the last thing that might be having issues: my bike. Then lo, I felt my back tire and it was pretty soft…a puncture. Not a normal one though as the air had clearly come out gradually and the tire still wasn’t totally flat. I thought it must be a slow puncture and I considered what to do. The last thing I wanted to try and do was change my inner tube as it was freezing cold. Literally freezing cold – it was the coldest day I had ridden in. 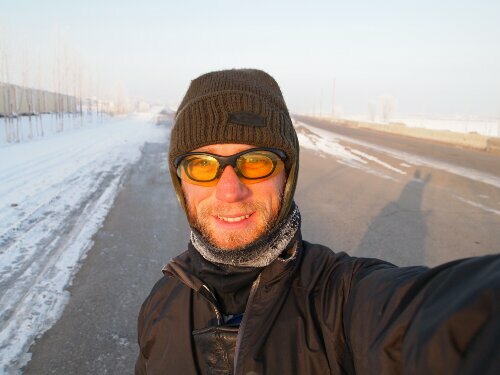 My water bottles were three solid blocks of ice on my frame – and my beard was frozen to my face scarf which was iced up with condensation from my breath. I didn’t think my fingers would retain motor control long enough to change a tire. So in the end I pumped it up and hoped for the best. I figured at worst the inflation would get me to the next cafe where I could perhaps take my wheel inside to change inner tube. Surprisingly the air lasted the forty remaining kilometres to Samarkand and I only had to inflate it once more in the city just to get me the final couple of kilometres to the place I was staying. I was pretty chuffed and I felt like I was flying for the remaining kilometres to the city. 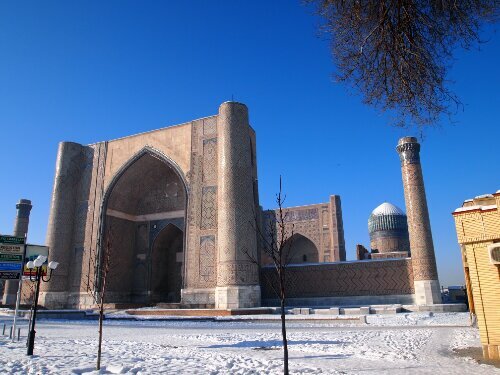 So I’d made it: Samarkand the jewel of the silk road, sat at the head of the routes to China, India and Persia and ancient capital of Timur the Great. It was New Year’s Eve too. 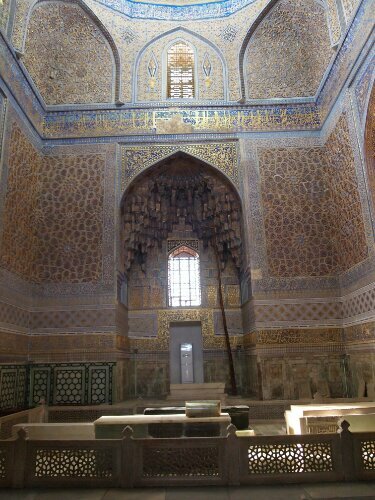 It turns out that Samarkand does incredible architecture better than NYE celebrations as pretty much nothing happened. There were a few fireworks and that was about it. I had some drinks with the people staying at the hostel I had chosen. 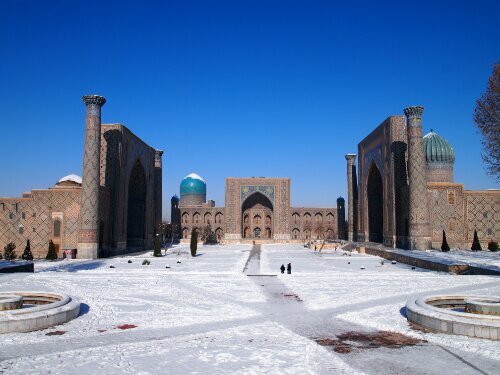 Coincidentally they were all Japanese – apparently Japan has a good deal on flights to Uzbekistan as nearly all the tourists I had met in Bukhara and Samarkand were Japanese. Also for some reason Japanese people consider Uzbekistan to be a ‘safety country’. Which goes to show that being a police state isn’t always a turnoff to tourists! 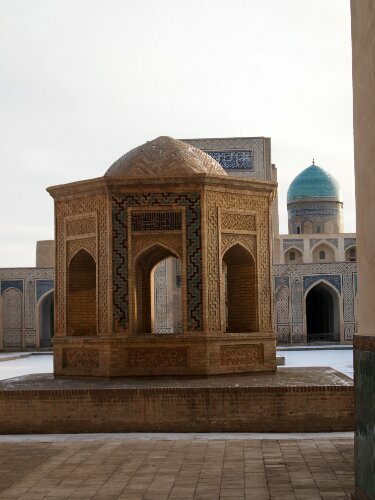 While NYE may have been a damp squib, the sights of Samarkand were not and I saw some of the first human wrought sights of the trip that truly took my breath away. 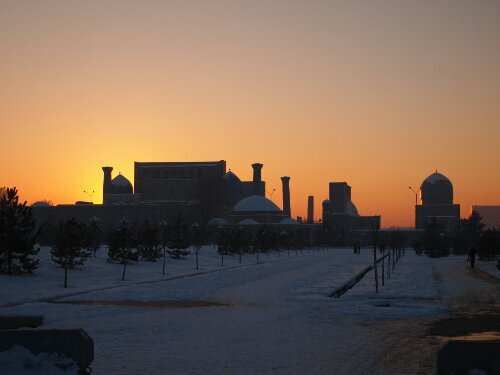 There was the registan, the centre of the city with three massive medressas facing into a square. I also had to do a bit of bicycle maintenance in Samarkand, having to replace my rear inner tube and tune my brakes. I also needed to find a mechanic as my bottom bracket was loose and I don’t carry the tool for tightening it. As soon as I asked the guy at the hostel if I knew of a mechanic I knew it wasn’t going to be easy. In the end it wasn’t too bad though – I only got passed on three times before finding a bicycle mechanic who could or would help. He didn’t have the specific tool needed to tighten my bottom bracket but he disappeared into his workshop for a few minutes from which came the sounds of metal screaming. Then he came out having ground out a tool he could use. He then tightened up the loose part of my bike and all for less than a dollar. I was ready in bike and body if not particularly in mind for the next 300km of possibly icy and cold and very probably bumpy road to Tashkent, capital of Uzbekistan and my final stop in the country. Enjoyed reading this and several other posts – but it does beg the question, why you would opt to cycle in this potentially very cold part of the world during their winter? I have a pipe dream to cycling in Khazakhstan and the region of Russian just above Mongolia having seen a documentary on the area. I was originally going to head through Iran and Pakistan but decided against it because of visas. Ideally I’d have left the UK three months earlier but I only came up with the idea of the trip a couple of months before I left so unfortunately it was winter when I arrived.